CEO Neil Male and his daughter Lily meet The Apprentice winner James White. Avid fan Lily, daughter of our CEO Neil Male met up with James White, the joint winner of this years’ Apprentice today. 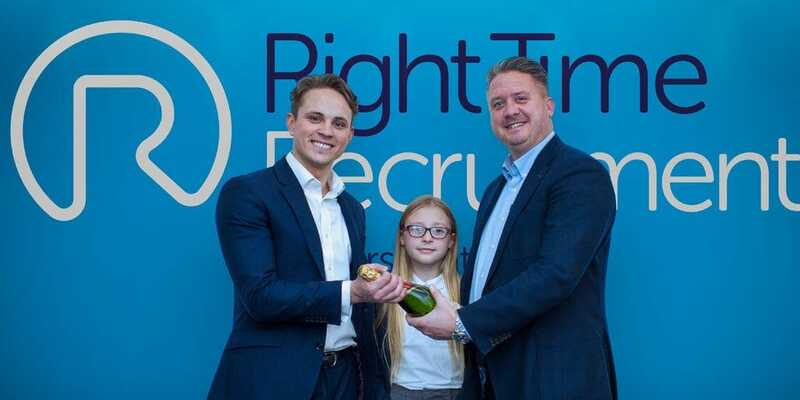 James took time out of his busy schedule to chat with Lily about her aspirations whilst showing her around the office so she could get a flavour of how a thriving recruitment business operates after £250k investment from Lord Sugar. Lily enjoyed the meeting immensely and did look a little awe-struck. The afternoon was rounded up by Lily presenting James with a congratulatory bottle of bubbly to say thanks. The GMS team would like to wish James every success in his new business venture with Lord Sugar.